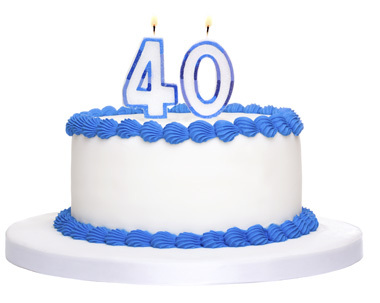 A gentle four note phrase hovers, a small colourful bird on the wing, leading, beckoning, from bush to branch. It is still, early, a breath of dew on the lawn where lines of cut grass betray yesterday’s mowing. The bird trills as the light brightens, slowly at first. The melody becomes more insistent. Then the thumping starts. A woodchopper in that nearby copse? No, the pianist banging his foot on the wooden concert hall floor. Moaning infiltrates the soundstage, voice exhorting listener to dive into the chord flourishes; the fellow is clearly enjoying his work. It quietens down as the performer continues to tease out the theme, playing with rhythm and making small ecstatic noises. Sometimes the chord pattern is sustained by his left hand as the right skitters up and down the high register of the keyboard, speedy Oscar Peterson runs that return to earth with the thick, swaying chords. Theme variation; an invitation into the musical world of a jazz pianist, though this does not sound like jazz. A transitional phase bridges into an imagined medley of popular tunes that never were. Things become pensive; more reflective, less bravura. A nod to Debussy, perhaps. Some meandering mid-register lines evolve into a short disjointed section that breaks the reverie and demands attention; an uneasiness creeps in, an edginess. Is this a thunderstorm brewing in the pastoral vista or the actor disrupting the illusion by tearing the painted backdrop? It does not last long. The delicate single line re-emerges as the performer – like a child entranced by a spider web – gets caught in a hypnotic series of downward runs; a new theme emerges, strongly reminiscent of the earlier one – the midday variation. This one, however, is driven by a repetitive five note bass figure. He builds it, layering right hand phrases over its insistent rolling rhythm. A teasing series of chords suggest a climax is imminent, but we return to the left-hand pulse. The right hand joins in with accompanying chords – it’s a wide-lapelled barrelhouse groove and we’re rockin’… then a swift deceleration, an echo of the melody and silence. End of side one: The Köln Concert. I enjoy the opening of the first piece/side, simply designated “Part I” [26:15], very much. The invitation into Keith Jarrett’s musical panorama is beguiling and romantic, an illusion that for me is rattled by the vocal intrusions and shattered by the foot-thumping. After that the chord assault seems too coarse; bludgeoning even. But it wasn’t always thus. 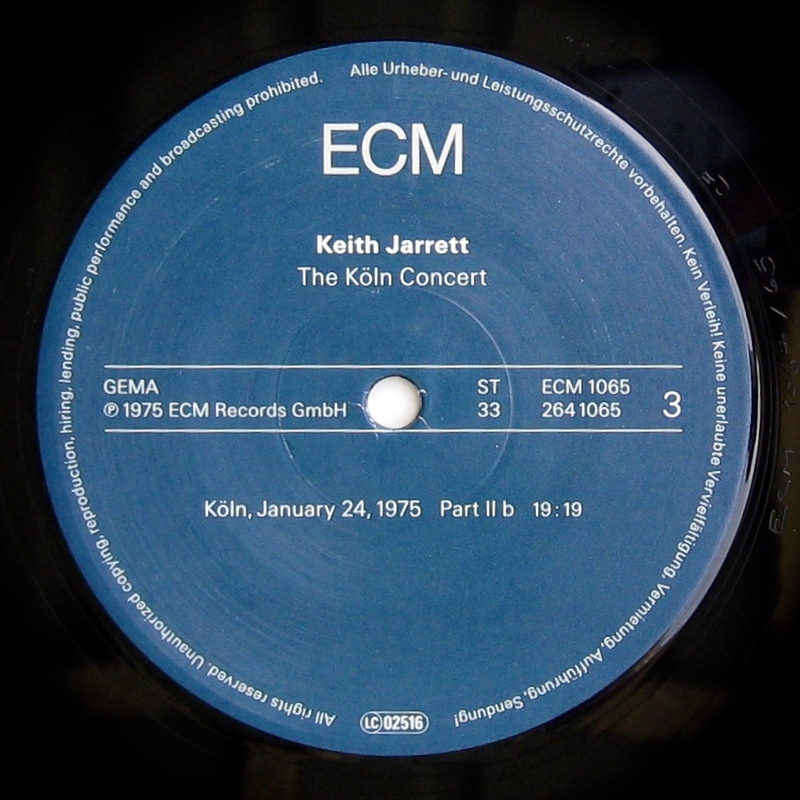 When I first heard The Köln Concert in the Rowden White Library listening room in late 1975, sprawled on a bean-bag wearing Japanese headphones, I was simply awed. Side two = “Part IIa”. It begins rhythmically with another short catchy melody underpinned by an ostinato bass figure. There’s a whiff of gospel in the energetic repetition. If you were in church you’d shout, “Amen!” But close your eyes you could be on a long train ride through the prairies. The forward momentum is relentless and irresistible. There’s humour too, as the sequence seems to stop… then resume in variation, rather like a brief stop at a small station before the train rolls on. It does stop eventually, quite suddenly, by a still, shady grove carpeted by surprisingly lush grass and wildflowers. Once again the pianist’s poetic soul emerges in the quiet passages. But he’s restless. This passage builds to a pulsating forté section before backing off again, rising once more; waves of sound and aural colour, ebbing and flowing. The ending of the side hangs, unresolved, and you scramble to get the continuation of the piece onto the platter. (No such problem with the CD as parts “a” and “b” flow seamlessly). And continue it does with further melodic and harmonic explorations over a range of moods. Changes emerge or leap; harmony, counterpoint, glittering runs and chord fanfares… the variety achieved by one man at a piano is quite astounding. There are passionate, rhapsodic climaxes and introspective interludes; both performed with a startling technique always in the service of the creator’s vision. Heard uninterrupted, the 33 minutes of “Part II” are a truly epic journey of lyrical invention and joyful testifying. Even the surprisingly downbeat ending somehow fits; you want this trip to end with a sigh not a bellow. I love the pause while the audience register that Jarrett has finished. They exhale before applauding with polite sustained enthusiasm. Side four is the encore. It sets out like a popular song with a whistleable melody and upbeat, joyous feel. According to Wiki, this is the only pre-composed piece on the album. Lots of fast runs display both Jarrett’s technical skill and his stamina, before he subsides into gentle reverie; the languid second half of this short piece is calm and pretty and leads us to a bucolic conclusion. 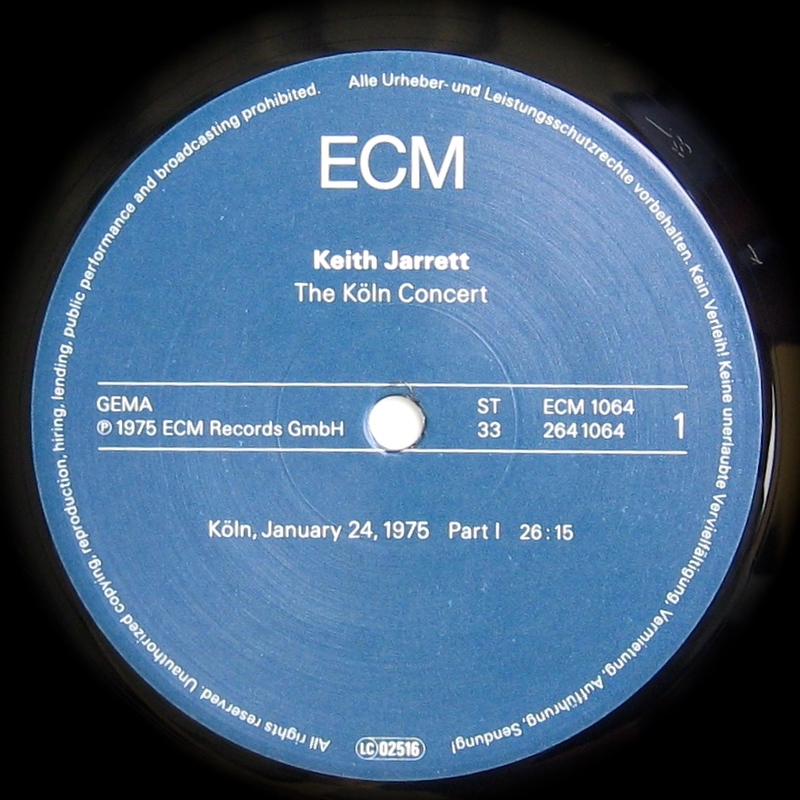 This was my first Jarrett encounter, circa 1975, and I was blown away by its soaring romanticism and rampant passion. It felt like entering the pianist’s inner world, seeing him naked and unafraid. That was somehow thrilling and just a little disconcerting for an uptight young bloke who had just completed – competently but without any discernable flair – 6th Grade piano. It showed me that there could be such a thing as ardent piano, even though I was not one who could unlock such fervour in himself. Maybe that is why I cannot quite bring myself, all these years later, to fully embrace The Köln Concert and gush about it without restraint. A residual embarrassment around such public nakedness constrains me. Still, it is an album of timeless lyricism and fecund creativity. Forty years later I’m more likely to reach for an earlier live album of improvised music when the Jarrett mood strikes. 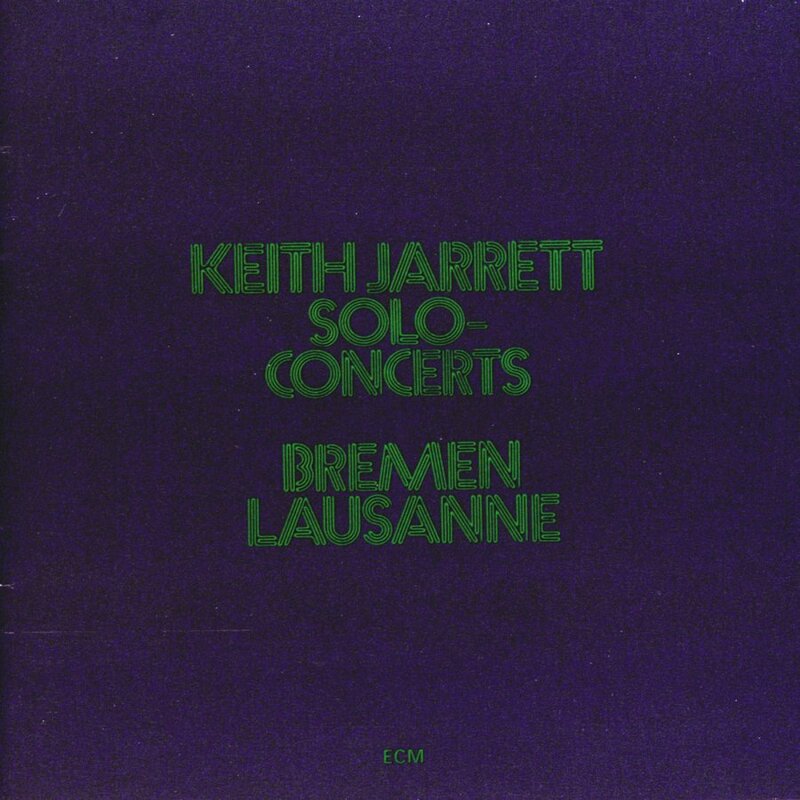 The triple album (three sides for each location) Solo Concerts: Bremen and Lausanne  has become a favourite. It’s a little less extroverted. In a ground-breaking event of international significance, 1537 and Vinyl Connection colluded to post on this album simultaneously. Read the view from Wales here. The Allmusic Guide review is extraordinarily positive and admiring. Have your own responses to The Köln Concert? great piece of yours here, my friend. 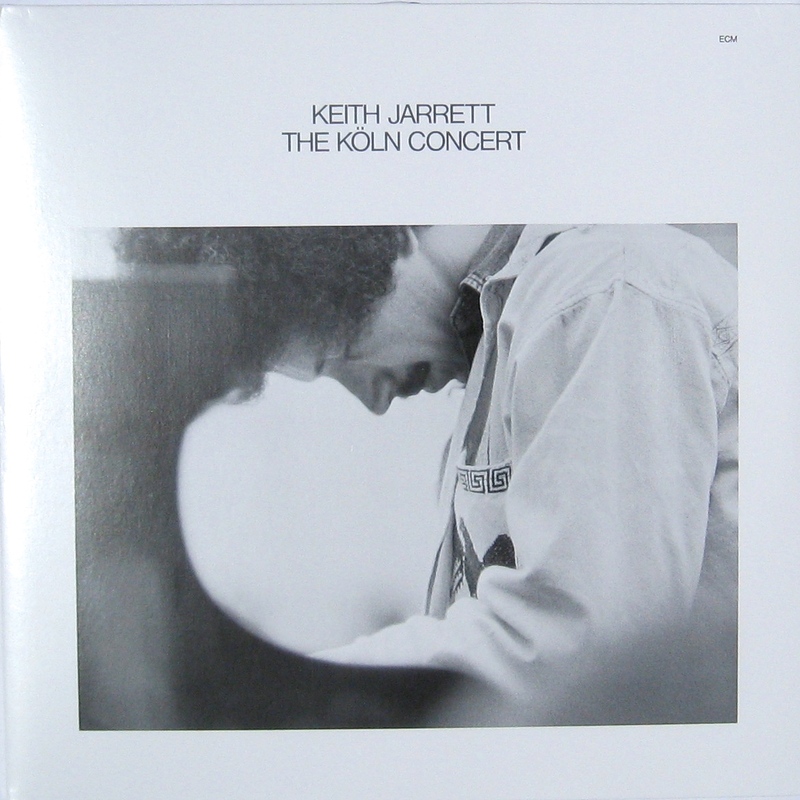 i’ve got both vinyl and cd of keith’s koln performance. a performance it is, indeed, with a melodic idea like just “let’s go out for a walk, will you?” and then all improvised paths, bridges, train rides, meadows and hills. at times, you’ve got the impression that keith’s stomping a foot or using his voice while playing is meant to keep himself grounded, materially, almost in danger as he is to vanish in the vortex of his music. i was able to reduce the sweet #4 to a guitar piece that i still enjoy playing once in a while. The guitar transcription sounds fantastic, P.
I like your idea of the artist’s insertions into the music having a grounding function. Makes me think more kindly of them! Thanks for your read and kind words mate. I believe that definitely qualifies as an internationally significant event, awesome idea for a simulcast! Sort of a two-day late type of simulcast! Perhaps it’s because the censors were worried about your frequent use of profanity – if my memory is correct, I think CBC in Canada had Don Cherry on a 7 second delay as such a precaution to have time to ‘bleep’ questionable content. So with a 2 day delay, the censors must really be worried about the language in your upcoming Jarrett review! Really enjoyed this, you get double bonus points for ‘fecund’ – one of my Top 5 All-time words ever. I also really enjoyed your swooping descriptions of the music. Interesting that you pull back from fully embracing this now, like an uptight pom! I can understand totally, but that emotional exposure of Jarrett’s is what really chimes for me with this LP now, as a reserved sort of fella myself I admire that, in others. Wonderful, highly-descriptive-without-sacrificing-feeling review. Between you and 1537, I’ve got it playing in my head even without ever hearing it. For a frightening moment I thought you had 1537 and Vinyl Connection in your head. Relieved to hear it’s Mr Jarrett who has infiltrated (via word). Thanks for reading and your kind words. Good reminder. Will be on the music box tomorrow. You made me want to bust his music out. Good one Bruce. That’s what we’re here for, CB! Hope you enjoy the spin.